This month, Nagasaki JALT was privileged to have Andy Boon from Toyo Gakuen University as our guest speaker. He gave two presentations which included his doctoral research project on IMCD as well as methods for moving English learning beyond the classroom. Those topics and the monthly Nagasaki JALT announcements will be covered in this post. Andy's first topic titled Instant Messenger: Journeys of Discoveries covered an interesting angle on the research process by using instant messaging software (Skype) to help distance learners work through difficult research problems and challenges. Here are some notes from his workshop-style talk. Problems distance learner (DL) masters candidates face include all of the above, but also primarily the face-to-face interactions are lacking or perceived as lacking. It's good to talk - ordinary interaction and non-judgmental interactions - the normal problems for interaction include the fact that usually people are only 1/2 listening and all the while forming automatic judgement based on opinion of the perceived issue or topic being discussed. In the IM model, there are two roles: The speaker (called the "explorer") and the listener (called the "understander"). The explorer is given the floor to discuss and the understander has the important job of listening and also empathizing. It is imperative that the understander maintains the role of being a 100% listener without bias or judgment. The understander role has the job of making the person feel as if they are being listened to 100%. It is as if they are a human tape recorder reflecting back to the explorer for the purposes of allowing the explorer to organize ideas and come up with a discovery internally. This cyclical process continues until the explorer makes a discovery. No input from the understander must be made despite the urge to advise. How do IMCDers use the space? What is revealed about the research process? Does IMCD facilitate the research process? Andy collected data from 31 sessions of IMCD from 8 different participants (2009 May to 2010 December) via Skype. He took field notes, the actual IMCD session transcripts, and a post-session email feedback. Using these individual case studies he performed genre analysis to build a picture of IMCD. Next, given a handout of an actual session, we worked on identifying the different moves in our groups. Viewing the data directly gave us a chance to understand Andy's research and the benefits it has for moving research puzzles and teacher puzzles forward with positive self-discovery. This would be an excellent tool for building listener skills. This might work well in marital counseling. Why spend the time waiting for a person to make a discovery if one could be presented by the understander in the first 5 minutes of the session? (a valid question which Andy handled well). Although time ran out in the session, the presentation certainly provoked interest and dialogue within the participants. Thank you, Andy! In Andy's second presentation entitled One Step Beyond the Classroom we learned some methods for encouraging students to take and use their English outside the classroom. 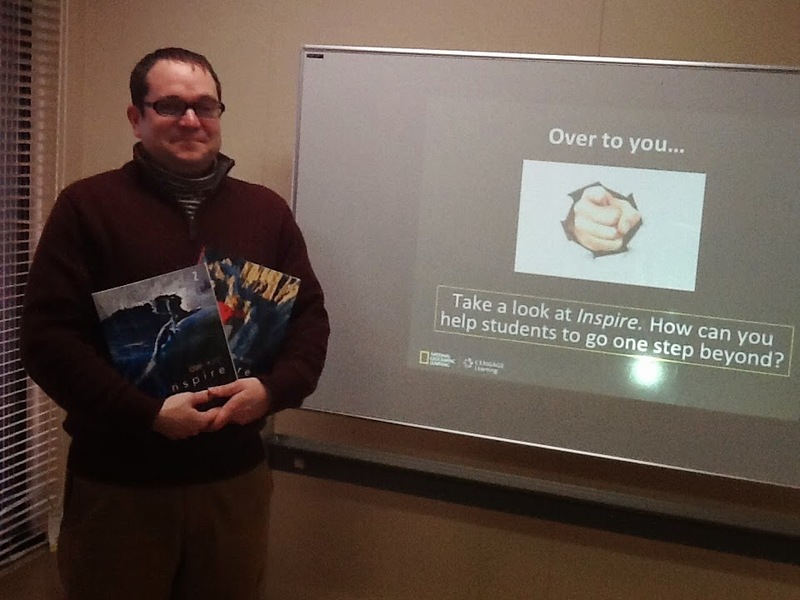 This was also an opportunity for Andy to promote the new textbook series from Cengage entitled "Inspire". 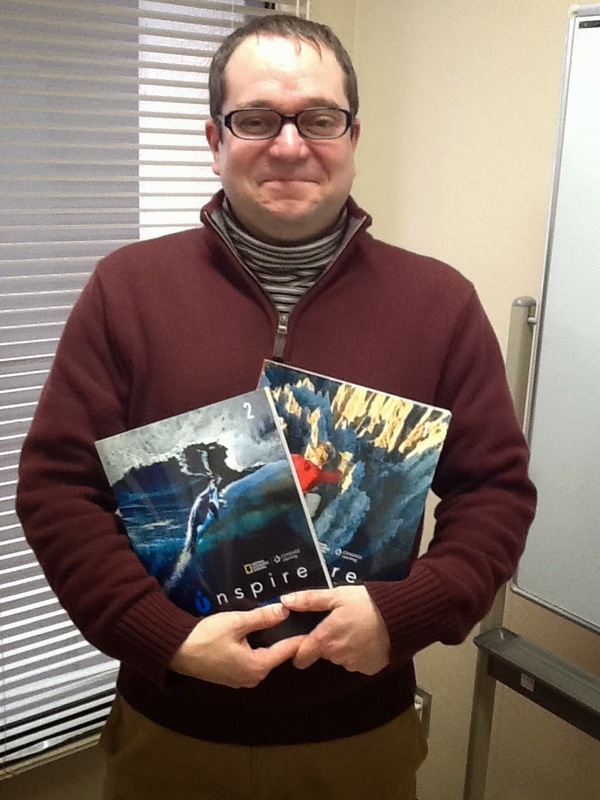 Inspire is a 3-level series book containing listening and speaking activities. In these activities, it is important to remember what is important; the process or the product? Thank you for the presentations, Andy! Hope to see you again soon! We were reminded that the deadline for presentation proposals for the JALT National conference in November is February 11th. The notes say "unsponsored presenters have until May" although I may have erred. PanSIG proposals are (were) due January 15th for the May conference in Miyazaki.